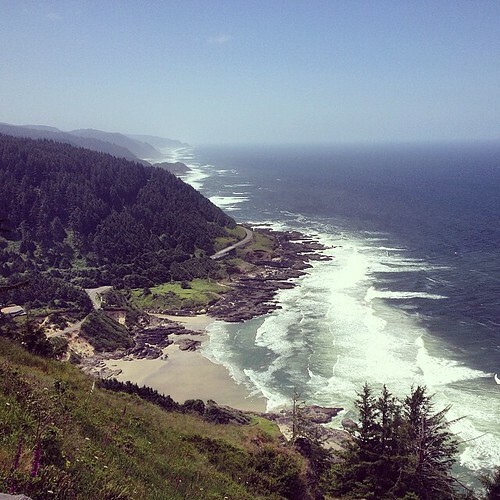 The tag line for the Central Oregon Coast is “Where the Forest Meets the Sea.” It is one of the few places in the country where one can hike in a mature forest of towering pines with rich undergrowth, while listening to and seeing glimpses of the ocean at the same time. It is also where over-sized sand dunes stretch for forty-two miles south to north, resembling a mountain range of sand. Where the dunes end, the rocky coastline made of volcanic rock, synonymous with this coast, begins. Two hundred foot vertical cliffs tower over surf beaten rocks below. Some are like small islands that provide refuge for birds and sea lions. Others jut out from their headlands, providing the viewer with dramatic wave crashes and exploding sea spray. While yet others, provide a protective sanctuary and nursery for burgeoning and delicate marine life in their tide pools. 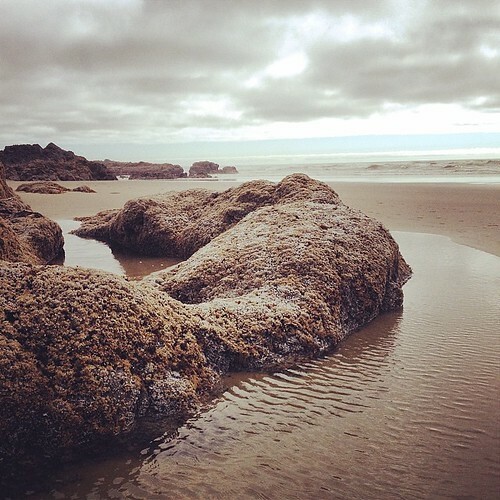 This entry was posted in Musings, Travels and tagged Carl Washburne State Park, Central Coast Oregon, Florence Oregon, Lighthouses of the Oregon Coast, Oregon Camping, Oregon Coast, Oregon Coast Highway, Oregon Coast Trail, Oregon coast travel, Oregon RVing, RV Oregon, Yachats Oregon, young fulltime RVers on June 19, 2014 by The RV Nomads.